Another week, another install. This time at the new Buck or Two location in Smith Falls. 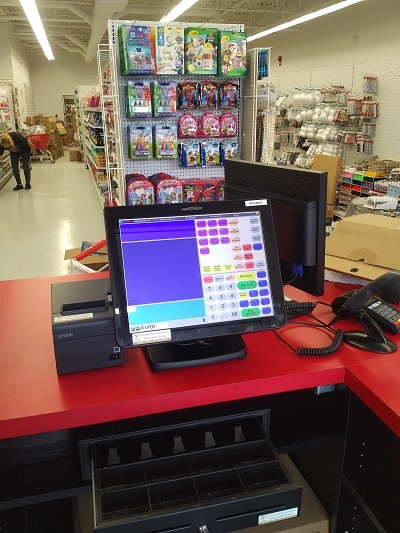 Our client chose the Partner Tech Quad Core SP-850 POS touch terminal as it offers both versatility and flexibility. No matter the POS functionality your require, the SP-850 can handle it, as it is designed for today’s evolving businesses. From customer relationship management to self-service and everything in between, the SP-850 touch terminal is up to the task. Shoppers frequently prefer to watch the cashier ring up sales in real time rather than review a receipt after the sale. That is why the customer-facing screen allows the customer to follow along as sales are tallied, or it can convey information about offers and promotions as shoppers wait in line. Since the SP-850 is constructed from die-cast aluminum, it will look elegant in any restaurant, retail or hospitality setting. In addition, Partner Tech offers a wide variety of peripherals that are easily connected to the terminal. Visit us at www.globepos.ca/hospitality/ to check out all Partner Tech systems on offer. We are sure you will find what you need and more!